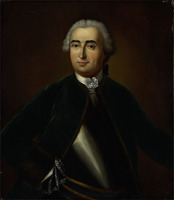 MAURÈS DE MALARTIC, ANNE-JOSEPH-HIPPOLYTE DE, Comte de MALARTIC, officer in the French regular troops; b. 3 July 1730 at Montauban, France, son of Pierre-Hippolyte-Joseph de Maurès de Malartic, Comte de Montricoux, an officer in the Gardes Françaises, and Antoinette-Charlotte de Savignac; d. unmarried 28 July 1800 at Port-Louis, Île de France (Mauritius). 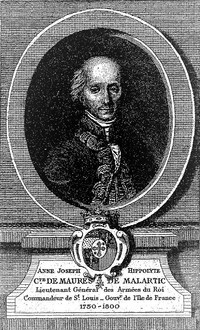 After studying at the Collège de Nanterre, near Paris, Anne-Joseph-Hippolyte de Maurès de Malartic entered the army in 1745 as a sub-lieutenant in the Régiment de la Sarre. On 8 Aug. 1746 he was named a second lieutenant in the Régiment de Béarn and on 1 November was promoted captain. He took part in campaigns in Flanders, Italy, and Provence and after the War of the Austrian Succession became assistant adjutant on 30 Oct. 1749. 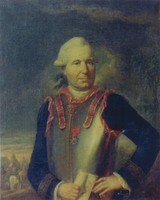 In 1755 he accompanied the Régiment de Béarn to Canada. Landing at Quebec on 19 June, he was sent to Fort Frontenac (Kingston, Ont.) and at that point began to keep a record of his regiment’s movements and the events in which he participated. The following summer Malartic took part in Montcalm*’s expedition against Oswego (Chouaguen). Although defended by more than 1,700 men, the British stronghold capitulated on 14 August, yielding considerable booty. Three days later Montcalm wrote to Lévis: “I cannot praise too highly my aides-de-camp, Lapause [Plantavit*], Malartic; I would have collapsed under the task without them.” Malartic subsequently went to the Lake Champlain region – to Fort Saint-Frédéric (near Crown Point, N.Y.), and to Fort Carillon (Ticonderoga), where in the summer of 1757 he joined the forces Montcalm was assembling to besiege Fort William Henry (also called Fort George, now Lake George, N.Y.). Malartic took part in the operation and was present on 9 August when the fort surrendered. Early in the autumn he went with the troops to Montreal. There he supervised distribution of food to the soldiers, who, like civilians, were subject to rationing. The task was not always easy because the soldiers were unwilling to eat the horsemeat served them. In June 1758 Malartic left with the Régiment de Béarn for Fort Carillon and worked at preparing abatis to protect the fort against the assault that Major-General James Abercromby’s troops were preparing. The attack was launched on 8 July, but the French troops put up a vigorous defence and, despite numerical inferiority, forced the British to retreat with serious losses. Wounded in the knee, Malartic arrived back in Montreal on 17 August and spent the winter as major of his regiment, keeping an eye on its billets. He had meanwhile been made a knight of the order of Saint-Louis. The following summer he assisted in the hasty reinforcement of Quebec’s fortifications, which offered poor protection. The British under James Wolfe* had landed in considerable force on the Île d’Orléans late in June and were beginning to besiege the city. Although their advance was checked on 31 July when they attacked the camp at Montmorency, below Quebec, their hold tightened inexorably, ending in their victory on the Plains of Abraham on 13 September. After the battle, in which he had a horse killed under him, Malartic withdrew to Montreal to organize winter quarters for the troops. He took an active role in the final campaign and suffered chest wounds in the battle of Sainte-Foy on 28 April 1760. He remained at Quebec until 5 June to take responsibility for the sick and wounded at the Hôpital Général, and to negotiate their evacuation with Brigadier-General Murray. 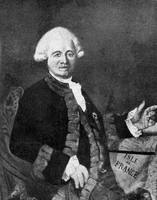 Then he went to Montreal and with Jean-Daniel Dumas tried to delay the British advance, but to no avail. After the surrender of Montreal in September, Malartic left Canada with the Régiment de Béarn, landing at La Rochelle in November. The following year he was put on half pay. 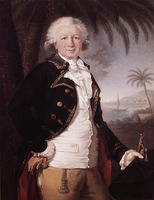 In April 1763 he was named major of the Régiment Royal-Comtois, and on 5 June colonel of the Régiment de Vermandois, a regiment he commanded for 17 years in Guadeloupe, Martinique, Saint-Domingue (Hispaniola), and Corsica. 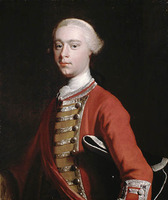 In 1770 he was promoted brigadier in the infantry and ten years later was named major-general. In some measure won over to the ideas of the French revolution, Malartic became lieutenant-general of the armies on 25 Jan. 1792, commandant general of the French establishments beyond the Cape of Good Hope, and on 17 June governor general of Île de France. He found this colony in ferment with revolutionary ideas, and through prudent measures he restored calm. In June 1796 he sent back to France the agents of the Directory who had come to enforce the decree abolishing slavery; his action spared the colony the disorders that broke out in the West Indies. He died at Port-Louis in 1800 and an impressive mausoleum was built for him there in gratitude for his service. [A.-J.-H. de Maurès de Malartic, comte de Malartic], Journal des campagnes au Canada de 1755 à 7760 . . . , Gabriel de Maurès de Malartic et Paul Gaffarel, édit. (Dijon, France, 1890). AMA, SHA, A1, 3498, 3574; LG, 1272/1. AN, Col., C11A, 105. Coll. des manuscrits de Lévis (Casgrain). Doc. relatifs à la monnaie sous le Régime français (Shortt), II, 922, 924. NYCD (O’Callaghan and Fernow), X. Dictionary of Maurician biography, ed. Auguste Toussaint (2v. to date, [Port-Louis, Mauritius], 1941– ). Le Jeune, Dictionnaire. “Officiers du régiment de Béarn,” BRH, LI (1945), 354–55. 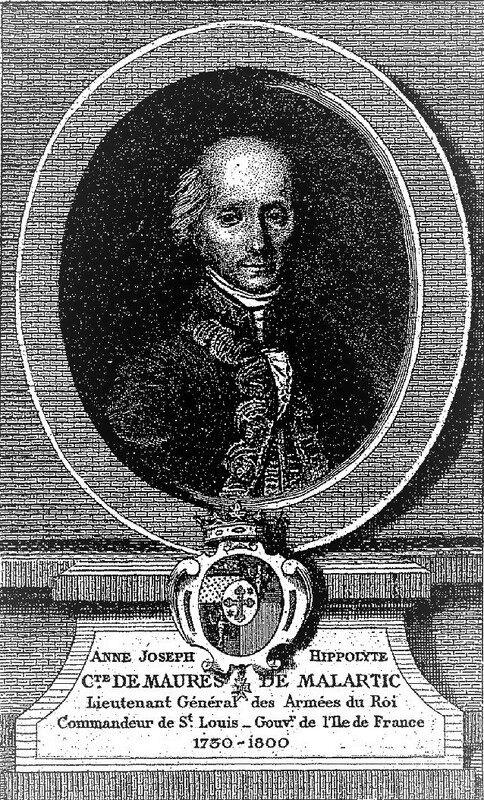 Étienne Taillemite, “MAURÈS DE MALARTIC, ANNE-JOSEPH-HIPPOLYTE DE, Comte de MALARTIC,” in Dictionary of Canadian Biography, vol. 4, University of Toronto/Université Laval, 2003–, accessed April 24, 2019, http://www.biographi.ca/en/bio/maures_de_malartic_anne_joseph_hippolyte_de_malartic_4E.html.